Fung-Away Systemic Fungicide cures and prevents all major lawn diseases including including brown patch. 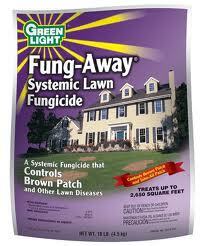 Fung-Away is a granular fungicide containing .39% Myclobutanil. Fung-Away offers both preventative and curative control for anthracnose, brown patch, copper spot, dollar spot, fusarium blight, leaf spot, powdery mildew, pink snow mold, red thread, rust, summer patch, take-all patch, and many others. 10LB bag treats up to 2,650 sq. ft.
Would you like to see the Fung-Away Systemic Fungicide Label? How about the Fung-Away Systemic Fungicide MSDS sheet?